Question: What does Growing Spaces, Rodale Institute, and Shumei Natural Agriculture have in common? Yes, it’s true… Here we go again. Janet and I, the lowly ventmaker, are ” off again to high adventure “. Well, 15′-6″ hi at least, to the top of the Growing Dome! 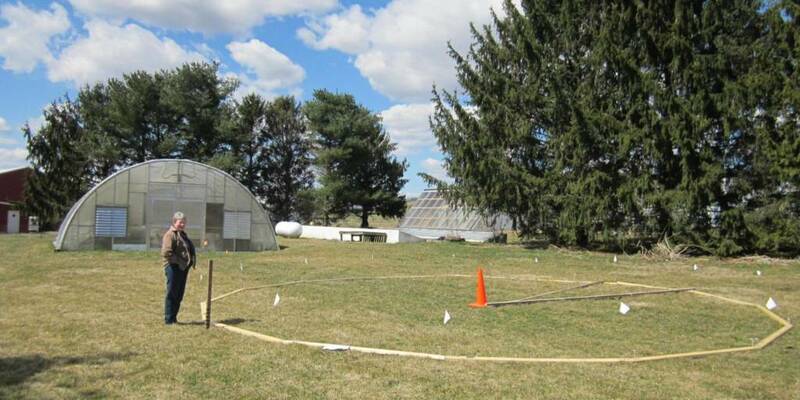 On April 1st, we will begin installing a 33′ Growing Dome at the Rodale Institute in Kutztown, PA for the Shumei Natural Agriculture garden. It’s been about 3 and half years since the existing 22′ Growing Dome was installed by Rodale and Shumei staff, volunteers and myself. So, this time, Janet is coming to make sure I do it right. I’ll keep you on the edge of your seat? 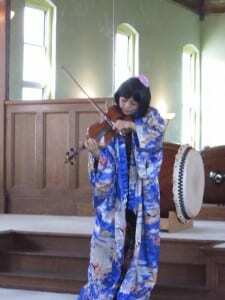 ?, with pictures and commentary. Think of it, it will be like you’re right there holding a piece of polycarbonate glazing for me and wondering why I’m in charge! For sure, this is a special project and we are honored to be part of it. 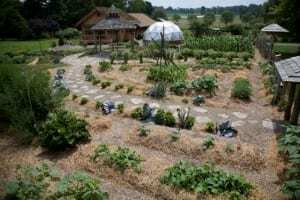 The science behind Rodale, the exquisite art of farming by Shumei and a greenhouse product that is ” Where Life Thrives “, all teamed up to provide a “working” model of a way to grow and think about our life, our food! 3-29-2013 Good Friday: WATCH OUT FOR THE HOLLAND TUNNEL when in Manhattan. When we arrived at JFK Airport the Shumei farmer at the Rodale Institude, Kenji Ban, met us at Delta airline arrivals and we were off. Little did we know it would take us 1:40 hr. to travel 6 blocks before Kenji could turn out of traffic and get us out of there. Finally, after dark we arrived at Rodale, and for now GOOD NIGHT! 3-30-2013 Sat: ALL PLAY AND NO WORK I’m sitting in the formal living room of an old, circa 1827, house at the Rodale Institute looking through Our Roots Run Deep, the story of Rodale. We are waiting for Kenji to pick us up for the new Shumei House party. 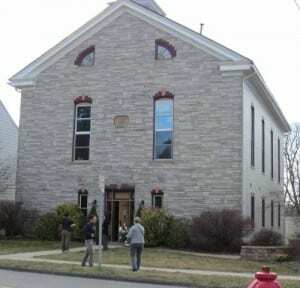 Shumei just purchased a 1868 old church in Lyon Station, near Kutztown, Pennsylvania. Janet and I had a GREAT time and the pictures explain some of it. 4-1-2013 APRIL FOOLS, you thought we were starting the Growing Dome, HA! HA! 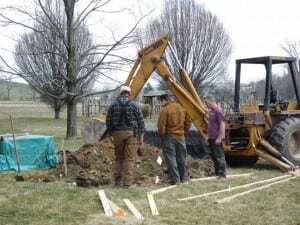 The pictures show our progress with digging holes/trenches for electric and looking for water lines. Next we can get to work on the greenhouse! Great article. I am always interested to keep up on the new grow dome installations that you folks do. The Shumei Center is a great place, very beautiful!